Makeup organizers made from high quality acrylic. Fits into the IKEA ALEX drawer cabinets. Available in 2 sizes. Assembled in no time and perfect for organizing your small and large powders, blushes, highlighters, bronzers, small palettes and much more. The Dividers for Compacts by TidyUps are customizable makeup organizers for your makeup and cosmetics collection and are made from solid 3mm clear acrylic. 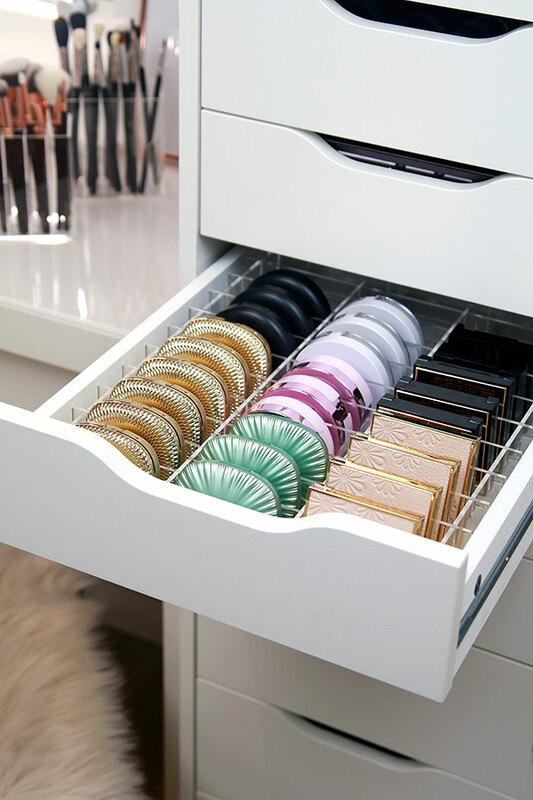 The perfect solution to keep your makeup and cosmetic products clearly arranged and organized. The Dividers for Compacts are assembled in no time. By removing one or more separation bars, you can also enlarge the compartments to your needs - depending on the cosmetics you want to store. The Dividers for Compacts are available in 2 sizes to fit perfectly whether into the IKEA ALEX drawer cabinets with 5, 6 or 9 drawers. Organize your makeup collection with the Dividers for Compacts by TidyUps - for a nice and clear overview of your makeup treasures! The Dividers for Compacts are suitable for organizing and storing compacts like powders, highlighters, bronzers, blushes, eyeshadows, small palletes and much more. 1x Dividers for Compacts. The dividers are packed individually.